Lord Ganesha has a special place among the Hindu gods. He is the first deity to be worshipped before performing any puja, and is known as the remover of obstacles. He is also known as the bestower of wisdom, which is why children are encouraged to chant His mantras and worship Him. With the elephant head storing all the wisdom in the world, Lord Ganesha is one of the coolest gods in the Sanathan Dharma. He comes with so many varied names that they would suit your choice. And guess what? These Lord Ganesha names for a baby boy are sure up for grabs. So, go ahead and choose the name you like for your little Ganapati as MomJunction brings you a stout list of Ganesha names. This name means ‘one who is indestructible’. Lord Ganesha was brought back to life after facing the wrath of Lord Shiva, making him indestructible. Lord Vishnu also carries this name. The meaning of this name is ‘one who is the first god’. Lord Ganesha is called with this name as he is the first among gods to be worshipped by Hindus. This word means ‘someone who is unique,’ and isn’t Lord Ganesha special among all the gods? If you also think your boy is unique, then this is the perfect name for him. This is a modern-sounding name and sounds special. The meaning, too, is special as it means ‘limitless’, ‘boundary-less’. Looking for an ordinary name with an extraordinary meaning? How about Amit? It is also a name for Lord Ganesha and means ‘endless’, ‘limitless’. This name of Lord Ganesha means ‘delight’, ‘pleasure’. It means ‘one who is invincible’. This is another name of Lord Ganesha, who is known as the Lord of all wealth and wisdom. It means ‘one who is filled with humanity and has a kind heart’. Giving this name to your son is like giving him blessings to lead a peaceful life sans hatred. You want your son to be mentally strong and remain unbroken in adverse situations. Consider this name, which means ‘one who cannot be broken’. The meaning of this name is ‘he who protects’ or ‘one who gives refuge’. It is a name given to multiple gods, and Lord Ganesha is also known by this name. This name means ‘ knowledge’ and represents the Lord of wisdom. This is also the name of the fourth Veda — Atharvana Veda. Look around and you will notice that Lord Ganesha is everywhere. This is because he is the Avighna or the ‘remover of obstacles’. The meaning of this name is ‘lord of the earth and king’, and is another name for Lord Ganesha. 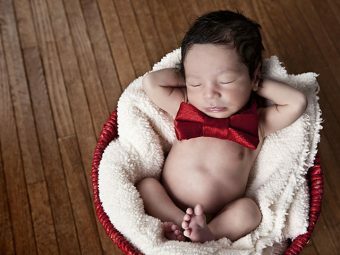 This is a cute name for your baby boy, and it means ‘little Ganapati’. Balchandra may not be a popular name, but it is still cute. It means ‘the moon-crested Lord’ and refers to Ganesha. Ganesha may appear all calm and peaceful, but make no mistake, He is a powerful God. Hence, He is also called Bhuvanpati, which means ‘the lord of the world’. The elephant God is the beloved of the Hindus and is believed to be benevolent in his blessings to his devotees. many, especially in the west and south India. He is also called Devavrata, which means ‘one who accepts all penances’. The name means ‘one who is righteous and is charitable’. Lord Ganesha is the epitome of dharma. If you want your son to follow in Lord Ganesha’s footsteps, then give him this name. The meaning of this name is ‘the one who is focused,’ and is another name of Lord Ganesha. Ganesha sure has divine blood. He is called Eshanputra, which means ‘son of Lord Shiva’. Gadadhara means ‘one who has a mace as his weapon’. A powerful name for a strong baby. The story goes that Lord Shiva cut off young Ganesha’s head in a fit of rage. Later, he fixed an elephant’s head to bring Ganesha back to life. Gajakarna is one more of Ganesha’s names and means ‘ears like an elephant’. Looking for a traditional name, rustic even? Try Gajanand. It means ‘having a face like an elephant’. Homage to Ganesh’s elephant avatar, Gajarup means ‘like an elephant’. Ganapati is the most famous of Ganesha’s names. It means ‘the Lord of all gods’. 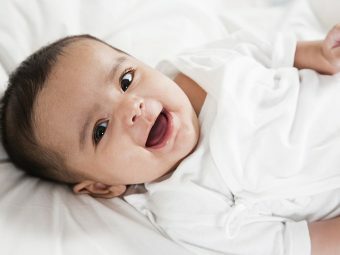 A unique name, Gaurik is a great choice for your baby boy. It is also one of Ganesha’s numerous names. This Lord Ganesha name means ‘the son of Goddess Parvati (Gauri)’. Lord Ganesha is the beloved son of Goddess Gauri. The name Gaurisuta refers to Ganesha and means ‘the son of Gauri’. Another name for Lord Ganesha, which means ‘the one who has golden-colored skin’. It would be a perfect name for your cute baby boy. The meaning of this name is ‘the one who is happy’, and is another popular name of Lord Ganesha. You want your boy to be happy throughout his life, so you may consider this name. Lord Ganesha’s character of a calm exterior and strong from inside makes him a hero for his devotees. It is something that is worth emulating, for sure. Another of Ganesha’s great names, Heramb means ‘a calm, respected and erudite person’. This posh-sounding name refers to the color blue, emerald. Another popular name, Kapila refers to Ganesha and means ‘yellowish brown in color’. The meaning for this name is ‘one who is pleasant and merciful,’ and so is given to many gods including Lord Ganesha. Are you a creative person? Then you’d want your son to be like you. Lord Ganesha is also a great poet, and so is also called Kaveesha, which means ‘king of all poets’. Health, happiness, and fame – now that’s what all parents want for their kids. Give your baby this Ganesha name; Kirti means ‘fame’ in Sanskrit. Kindness is in short supply these days. So make sure your son learns empathy. Let him follow in Ganesha’s footsteps and so name him Kripalu, which means ‘merciful’. A beautiful and lyrical name, Krti means ‘the lord of music’ and refers to Lord Ganesha. You don’t have to go to a mountaintop and spend years in a trance to please your god. Lord Ganesha is a kind God, and that is why he is called Kshipra, which means ‘easy to appease’. A name you won’t often hear, Lambodar is just one of the many names of Lord Ganesha. It means ‘the Lord with a huge belly’. This is another name of Lord Ganesha, which means ‘the one who has super strength’. The name means ‘someone who is kind and generous’. If you wish your son to become kind and generous, give him this name. Another name for Lord Ganesha, who is known to be auspicious. This is why Hindus do a Ganesha puja before starting anything important in their life. A beautiful name, Manomay refers to the amazing Lord Ganesha and means ‘the winner of hearts’, which sure you want your son to be. Lord Ganesha is bestowed with this name as he has conquered death. 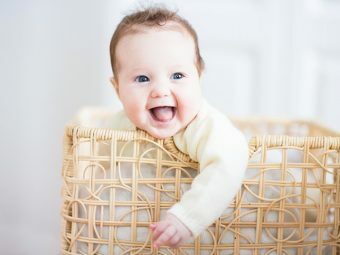 This name is like a blessing to your baby to have a long and healthy life. Mundakarama means ‘abode of happiness’. A classical sounding name, it is a good fit for someone looking for a very traditional name. God is the source of eternal happiness and joy. Ganesha is also called Muktidaya, a nice name that means ‘the bestower of eternal bliss’. The name means ‘an achiever’. Wouldn’t you want your son to achieve new heights as he grows up? This is one more name of Lord Ganesha that means someone who is pure and spotless. This could be an apt name for your innocent and pure baby boy. This Lord Ganesha name means ‘the bestower of wealth’. There is a belief that a house, where Ganesha is worshipped, is filled with happiness and wealth. This means one who has the form of ‘Om’, the sound that has been in existence since the beginning. Also, Lord Ganesha is known as the God of new beginnings, so he is known by this name. Your boy is the shining star of your family. Give him this name that means ‘full of light’, ‘brilliance’, and represents Lord Ganesha. This name suits the first baby to be born in the family. It means ‘the first among all’. This Sanskrit word means ‘happiness’ or ‘joy’ and is one of the names of Lord Ganesh. Pick this name if you wish your son to be happy and prosperous throughout his life. It means ‘the Lord of prosperity’. Lord Ganesha is associated with three concepts Riddhi (prosperity), Buddhi (intellect) and Siddhi (spiritual achievement). The meaning of this name is ‘the one who is the acceptor of all celestial offerings,’ as Lord Ganesha is the first God to be worshipped before beginning any task. This is another name for Lord Ganesha, who is known as ‘the bestower of skill and knowledge’. Lord Ganesha is addressed by this name as it means ‘the son of Shiva’. Being the son of Lord Shiva, Lord Ganesha is bestowed with this name. It means ‘the one who has the power of Lord Shiva’. Yet another popular name of Lord Ganesha, Shashivarna means ‘the one who has the complexion like that of the moon’. According to the legend, after striking Ganesha with his weapon, Lord Shiva bestowed life in him from his soul, thus giving him this name, which means ‘born from the soul of Shiva’. The meaning of this name is ‘the abode of beauty’. The name is given to various Hindu gods, with Lord Ganesha being one of them. The life story of Lord Ganesha teaches us good virtues. Hence, his devotees call him by this name, which means ‘the master of all virtues’. Lord Ganesha is invoked to bring prosperity and everything good. Shubham means ‘auspicious’. It is believed that praying to Lord Ganesha before the beginning of any task, makes the work a success. Hence, He is also known by this name, which means ‘the bestower of success’. The meaning of this name is ‘the one who has a beautiful face’. Legend has it that when Lord Ganesha was struck by Lord Shiva, his body illuminated and entered the circumference of the moon, and Ganesha acquired all the moon’s beauty. Also, the shape of his head resembles the integrated nature of Omkar, thus giving him the name Sumukh. This name means ‘the lord of the lords,’ as Lord Ganesha is worshipped before any god. This is one of the classic names for a baby boy. This Lord Ganesha name means ‘having pleasing or beautiful looks’. The name represents strength. It means ‘strong’ or ‘eyes of a pigeon’. This name means ‘the protector of all’. You can pick this name for your boy if you wish him to be brave and save others. This popular name means ‘ageless’. Choose this name as you want your son to be ageless no matter how old he grows. Lord Ganesha is the son of Goddess Parvati, who is also known as Uma. Umaputra means ‘the son of Uma’. Want to give your son the name of your favorite god Ganesha, but not something very common? Try Uddanda. It means ‘the nemesis of evil’. Legend says that Lord Ganesha is easy to please and bestows boons to his devotees, which gave gives him this name. It means ‘the bestower of boons’. This name of Lord Ganesha means ‘one who is the bravest of all’. This name means ‘one who is full of knowledge and wisdom’, and is one of the many names of Lord Ganesha. Give this name to your boy, who would walk in the path of wisdom. The name means ‘the king who removes all obstacles’. Another name of Lord Ganesha who is known as the. This name means ‘the demolisher of obstacles’. This is a popular name of Lord Ganesha for boys; the meaning of this name is ‘the remover of obstacles’. The meaning of this name is ‘ferocious’, and ‘the one who has a magnificent personality.’ This could be a nice name to pick for your son. This name of Lord Ganesha means ‘the master of the universe’. The Sanskrit word means ‘atmosphere’ or ‘sky’. This is another name of Lord Ganesha, who is the leader of the five elements. Lord Ganesha is the epitome of success. If you also wish your boy to be successful and bring fame to the family, you may pick this name, which means ‘eternal success’. This name means one who accepts spiritual offerings during yagnas, and is another name of Lord Ganesha. Meditation helps balance your emotions. It is believed that reciting Ganesh mantras during meditation help achieve peace. Therefore, Ganesha is called Yogadip, which means the ‘lord of meditation’. Lord Ganesha was an ideal son. His life is an example of a man of virtues, and children can learn a lot from his stories. 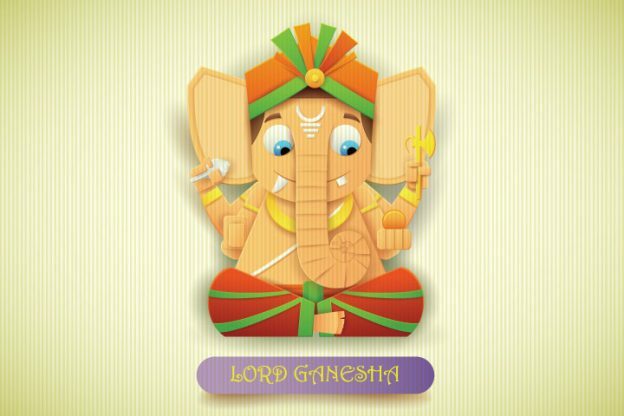 Let the blessings of the God of wisdom flow to your child by naming him after Lord Ganesha. What is your favorite Lord Ganesha name? Let us know in the comments section below.